Liquid Performance is known for being a quality bike cleaner. We use this stuff at the scooter shop to keep the bikes in the showroom glistening under the bright fluorescent lights overhead. What's nice about the Street Bike Kit is that it contains everything you need to really clean up those plastic panels on your crotch rocket in a convenient, easy to store box. It's really annoying when you've got a bottle of cleaner but you can't find the polish that goes with it, even though you know it's somewhere in the garage. 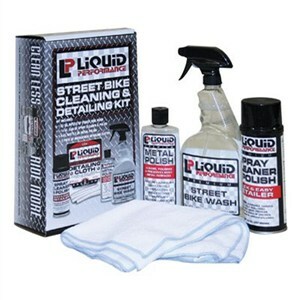 The kit contains the Street Bike Wash, which you spray on, let sit for about 5 minutes, and then rinse off with a hose or a bucket of water. Next is the Spray Cleaner and Polish, which is great for quick cleaning and/or giving your bike that "freshly waxed" kind of look. It also smells of coconuts and is actually quite enjoyable. There is also a bottle of Metal Polish, which could be used to polish up your robot (I'm pretty sure that's what it's there for), but I've only used it for scrubbing the grime off the exhaust and the handlebars so far. The kit also has 2 microfiber cloths that won't scuff or scratch any plastic. Remember, kits make individual bottles harder to lose.